When on vacation, my family and I enjoy studying facts about the area where we are staying. So, at the start of our Gatlinburg, TN vacation, I bought the book “Great Smoky Mountains Trivia ” at the Visitor’s Center. While our kids had no idea, my husband and I immediately understood the reference to Smokey Bear in a few of the questions. For those of you who are too young to remember, let me educate you on Smokey Bear’s wisdom. While still active, the campaign now features a realistic-looking bear, still pointing. However, those of us who remember Smokey Bear likely realize the significant absence of this campaign as compared to its heyday. “Great Smoky Mountains Trivia ”explains that foresters now recognize fire can benefit nature. Today, park managers decide on a case-by-case basis whether or not to fight fires or allow them to clean the forest. Additionally, the National Forest Service now educates people on the benefits of fire. They still educate about fire safety and being responsible to not carelessly cause a forest fire that could destroy homes and wildlife, but the finger-pointing pressure seems to be off of “YOU” just a bit. In fact, forest experts explain that fire can significantly benefit forests so much so that they sometimes intentionally start or “prescribe” them. Reduces excess brush, shrubs & trees that stifle new growth. Encourages new growth to flourish in space created by burned excess. Maintains structure for the many plants and animals that need fire to stay healthy. Reduces catastrophic damage from unplanned fires that destroy homes and other land beyond the forests. The key with “prescribed fires” lies with their execution at the hands of experts who carefully plan the fires so they can be used in constructive ways. Just like forest experts use “prescribed fire” to benefit the forest, God also uses fire to purify, cleanse and refine us. He uses it to prepare us as vessels for “honor, sanctified and useful for the Master, prepared for every good work” (2 Timothy 2:21). Without God’s refining fire, we become overgrown with excess. We become distracted, our lives filled to the point that new growth cannot flourish. Even our basic structures become damaged because we can no longer fit in that (fellowship & time with God) which promotes growth. 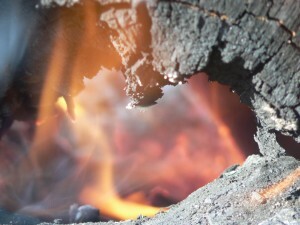 God’s refining fire, his “controlled burn” in our lives reduces excess. This process purifies and strengthens our love making us increasingly aware of what Sorge describes as the “apathy, greed, lukewarmness, materialism, and the self-indulgent spirit” of the culture in which we live. 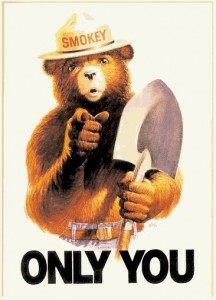 Unlike Smokey Bear, God does not point at “YOU” to prevent fire in your life. Instead, He asks that you look to Him as the expert in refining through fire, trusting that His “controlled burn” results in healthier and stronger lives. DISCUSSION: How do you react to the “controlled burn” of God’s expertise? This post connects with an Internet Book Study introduced to me by my friend Rick at Planned Peasanthood. In addition to Rick’s posts on the book, be sure to also check out those by Jason, Dusty, Sarah, and Glynn. The “club” covers a chapter in the book “The Fire of Delayed Answers ” by Bob Sorge every two weeks.